Poll Results: Would You Own a Gray Market Kubota? A classic example of a gray market Kubota - the L1501. A little while back we posted a poll attempting to gauge how gray market Kubotas sit with readers of OrangeTractorTalks. We wanted to know what people thought of the gray market equipment that our friends at Kubota corporate have warned about. Would anyone want to actually own one of these? 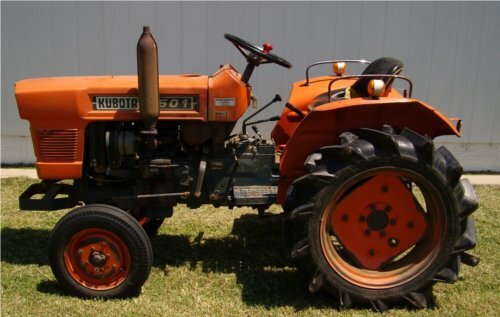 Gray market tractors, specifically Kubota grays, have had an interesting history involving leaving Japan in large volumes and eventually arriving at their second homes all over the world. Emails and visitors from all around the world arrive asking questions about their gray market equipment. Folks from Greek islands, South Africa, Australia, France, Germany, Spain, Iran, Ireland and closer to home too – Camrose Alberta or Moosejaw Saskatchewan. 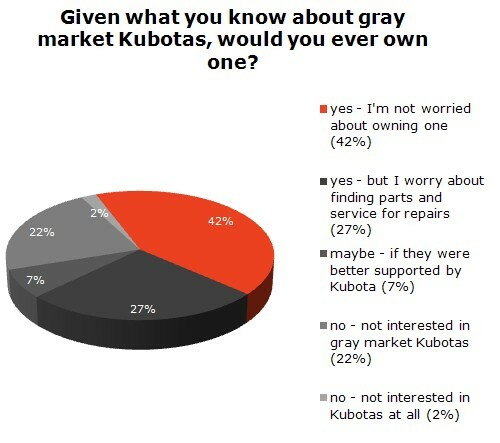 After 300 votes, almost 70% of folks feel they have no problem owning a gray market Kubota. A full 42% of those voting indicated they had no worries when it came to the special type of ownership that comes along with owning a gray market tractor. 7% were still on the fence – not sure if the hassle and lack of support from their dealership is worth it. Some might say that the poll is skewed a bit. After all, this is an orange tractor enthusiast site, so any responses to the poll would likely reflect positive feedback for ownership of any orange units, even if they are labeled as gray market. I am sure owners of gray market tractors responded to the poll. If they have had negative experiences with their equipment I think we would have seen higher figures for the choices “no – not interested”. Despite the rumors and supposed horror-stories, a lot of people can see value in those gray market Kubotas – enough so that 7 out of 10 would own one. It is true that your local Kubota dealer might not be all that helpful when it comes to the great deal you found in your local agri-trader that you now want to fix up. Fear not – there are places to find parts and helpful advice when it comes to that gray Kubota (hint: you are at the site now). Stay tuned for another poll to come out in the next day or two! Poll: Would You Own a Gray Market Tractor?